Applying Music in Exercise and Sport CE Course combines research, evidence-based practice, and specific recommendations to enable practitioners to use music to enhance physical activity enjoyment, motivation, and performance. Apply scientific principles to personal workouts and group exercise classes and in both individual and team sport settings. 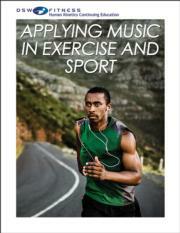 Understand the science underlying how music can be applied to exercise and sport. Explain how music can be used to influence specific behaviors and emotions. Determine which music tracks to play to promote or suppress certain emotions. Evaluate psychological outcomes associated with various music programs. Select music and measure its effectiveness when used in individual, group, or team settings. Create effective playlists with purposeful selection of tracks to optimize psychological responses and enhance performance. Consider legal issues regarding the use of music in exercise and sport environments. Applying Music in Exercise and Sport Print CE Course combines contemporary research, evidence-based practice, and specific recommendations to help exercise and sport professionals, coaches, students, researchers, and enthusiasts use music to enhance physical activity enjoyment, motivation, and performance. Learners will explore the psychological and physiological effects of music and learn how to apply scientific principles to personal workouts and group exercise classes and in both individual and team sport settings. The study guide for Applying Music in Exercise and Sport Print CE Course includes a course syllabus, learning objectives, learning activities, and referenced answer key. It emphasizes key concepts of the book to prepare individuals to pass the exam, composed of multiple-choice and true-or-false questions, at the completion of the course. Upon passing the 85-question exam, individuals may print out and submit a certificate for continuing education credits. Applying Music in Exercise and Sport Print CE Coursecontains all of the necessary information for new and current personal trainers and fitness professionals. Learners will gain confidence in designing music programs for various populations and obtain the skills necessary to explain to clients how specific musical selections can help them to achieve their goals.